When the local distributor (Radbitz) for MagMod let me know that he had one of 5 MagBox prototypes in the world and I could take it out for a test, it’s not the sort of opportunity you turn down. “Sure, just drop it off with me for a month or sixty and I’ll give it a test” after all, I am a completely unknown photographer with no reputation, and a dismal 1500 followers. What could go wrong? Sadly, my sneaky ruse to get a free MagBox failed before it started. It seems there are so few of these little babies in the real world that people are prepared to beg, borrow or steal to get their hands on one. As a result, Adam Kopf wasn’t prepared to let it out of his sight. I dragged out a mate, Greg Cromie who is a photography gear fan, fellow blogger and alround nice guy and we headed off to shoot in the hope that he could distract Adam long enough for me to put the MagBox in my car. Mission unsuccessful. Surprisingly enough, I couldn’t see a MagBox review up yet, so I may actually be the first to officially post my review. Greg has posted some nice behind the scenes photos on his blog from the day. 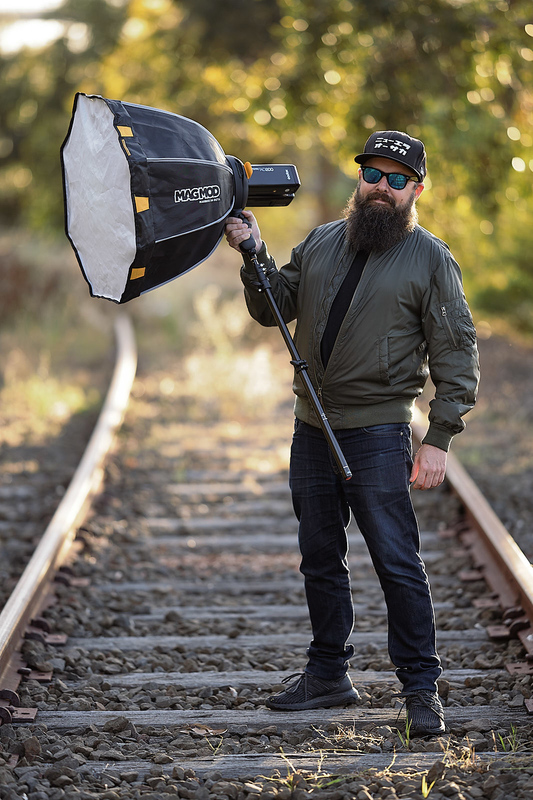 Magmod is a company that built a name for themselves as a company that makes magnetic photography modifiers, a clever concept that makes it easy to change modifiers. I have their creative speedlight kit and it is awesome, although my biggest issue to date is that I don’t actually use speedlights much. It’s a necessary evil for certain occasions where you don’t have a choice. For me personally, I like natural light or strobes so when you introduce strobes with decent size octa’s and AD200’s or AD600 Pro’s, that’s where things gets really interesting. 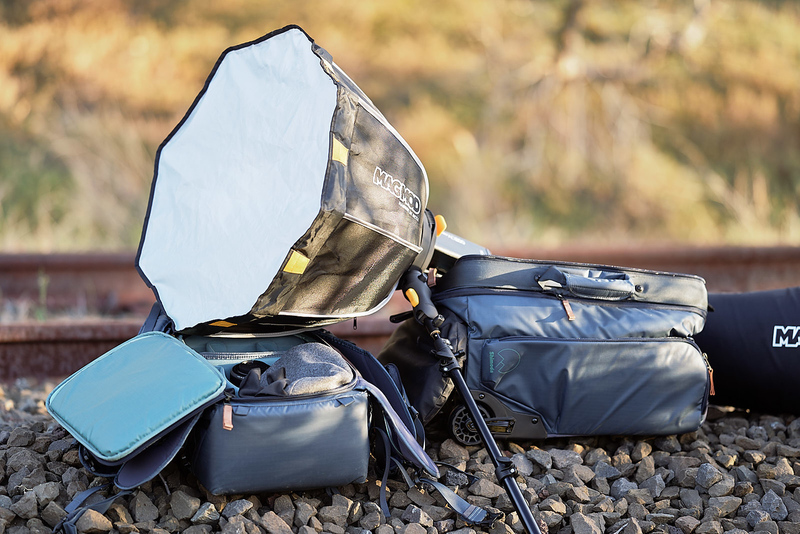 The MagBox is a new Kickstarter 24″ magnetic softbox (octa) that can be setup quickly, with components like gels that can be easily attached and removed due to the use of magnets. No velcro on the front baffle as an example. It comes with options for both speedlights and strobes, with mounts coming for Bowens, Elinchrom, Profoto and Alien Bees. I won’t try explain further, the video from Magmod does a much better job of giving you an idea of how the product works. The vast majority of these photos were shot with a Sony A7iii and a Sigma 135mm f/1.8. 135mm is one of my favorite focal lengths for portraits as I love the compression. I shot some of the photos on the 85mm Batis but the location was suited to a longer focal length so I stuck with that. From a lighting perspective, we were using the two Godox AD200’s along with a Godox XPro Trigger. Photos were shot in TTL which, to be honest was pretty damn impressive, both from Godox and Sony in terms of the exposure. I did have minor striping issues (documented issue with the PDAF sensors shooting into the sun). In this case, I haven’t corrected them, mainly because I’m sitting on an island in the middle of nowhere having a holiday and I didn’t have the bandwidth to do it. On the AD200 front, if you are using two of these, I’d recommend using the cable to try lighten the head weight. Adam did an amazing job holding it up for an hour and a half but I wouldn’t recommend this as a permanent solution. I set up a sunset shoot on a decommissioned railway line in Port Melbourne, Australia. After careful checks on the railway line status, I confirmed it had been decommissioned. I also drove the railway line to double-check and discovered it had been cut in pieces at a number of points, so in the absence of the hover train from “Back to the Future”, nothing was going to travel on this line. I can’t stress enough about the importance of safety when shooting on railway lines. Make sure the line is unused, and double check, it’s simply not worth the risk. I also understand that shooting on railway lines is illegal in some countries so please be aware of your legal obligations. The model in this case was @nataliecalafiore who was absolutely incredible for the shoot. It wasn’t the easiest location, rocky ground with no shoes, uncomfortable railway pillow so a big thank you to her and the amazing job she did with absolutely zero complaints. I didn’t get to look at the construction with a fine toothed comb, we were rushed for time on the shoot, but from what I saw it is pretty solid and sturdy, particularly when you realise it’s all connected with magnets. I couldn’t tell whether there were any major issues with construction but on the surface, all seem good. The plastic used seems very robust and the overall quality of the softbox seemed to offer premium quality. Adam, one of the owners of Radbitz put it together and everything went together very quickly, such is the beauty of magnets. We had two Godox AD200’s so all had to do was fit two of the usual MagMod attachments to the front of the AD200’s. I would assume most users would leave these attachments on permanently. Open the back of the mount, put the two lights in, close the back which I think is there to add extra security so it doesn’t fall out if it gets knocked. Opening the softbox is quick and easy, like opening an umbrella. I have the RimeLite softbox which is amazingly easy to set up by general softbox standards, but this kills it from a speed of setup perspective. You’d be shooting long before anyone else. The front diffuser also attaches with magnets which means taking the diffuser on and off isn’t a problem. Nothing I hate more than the velcro sound of putting the front diffuser on and finding a problem with it. Are you paying for ease of setup? No, The real value of this setup comes with the ease of changing things, swapping on a larger softbox, a gel filter or a grid, and I suspect that is where they are taking this, it won’t stop after one softbox. When we started to set up the AD200’s, I immediately put on the strobe style bulb instead of the Fresnel Flash head to disperse the light better in the soft box. The problem is that the globe attachment doesn’t fit. Adam indicated that they had designed it specifically to disperse light from a Fresnel head so this would be an issue. The lack of inner baffle was another concern but I was told, in line with the Fresnel head, Adam indicated the design has been specifically designed to avoid this. How did it perform? No hotspots so my fears were unfounded. I took some photos of the softbox in use and I couldn’t find any indication of hotspots, even when I under exposed to see the light spread. Given the use of a Fresnel herd with no baffle, I think MagMod did an amazing job. The gets and the focus diffuser weren’t used during the shout so unfortunately I can’t comment on the effectiveness of them. With 2 x AD200’s shooting at sunset, it was more than enough for what we were trying to achieve. Is any product perfect? Nope. So what could MagMod improve? I think a lot of the improvements are products that are already coming. A bowens mount for me personally would make this a no brained for me flexibility of using it with my AD600 Pro. This has been listed as an option with the crowdsourcing initiatives but I didn’t get to see or try this. Larger soft boxes – 24 inches (71cm) is fairly small by softbox standards. I understand why they started with a 24 due to the cross compatibility with speedlights which aren’t powerful enough for larger softboxes but a 90cm / 36inch would be a great addition for these with strobes. MagMod haven’t officially confirmed it but I believe that’s their intention. I have the Rimelite Speedbox 95cm so it’s been interesting to compare. In the absence of side by side testing, it’s hard to say emphatically that the light quality is better with either model so I won’t pretend to try convince you either model is better. Interestingly enough, both products find themselves in similar territory from a pricing perspective. The MagBox is the exact reason I got the Rimelite Speedbox, quick setup time with minimum effort and high quality results, and that’s where the Magmod wins. Where it loses is the lack of range. The Speedbox is available in a variety of sizes ranging from 55cm to 95cm. Ultimately it means if you need a variety of softboxes now, the Rimelite options are going to be better, but it’s not to say you can’t mix and match with a Bowens mount. I think MagMod hit the nail on the head with this product. I think products like the Rimelite have got close to date, but one of the things I like about MagMod is that it seems to make lighting a little more approachable for everyday people. I think what is really appealing about this is that it will open the door to a whole new generation of people using modifiers who may have been too scared before. 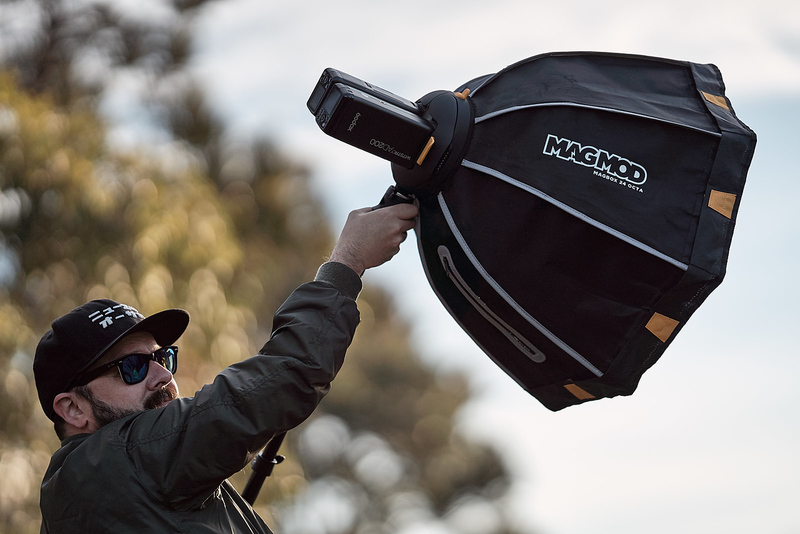 Whilst the lack of range is an issue, I suspect a lot of the buyers for the MagBox are going to be first time softbox buyers, and I’ll be honest and say I think that is a good thing because I think people will get far better outcomes from the Magbox that it may coax them into using better modifiers. For professional buyers, I think the idea of having portable softboxes will be extremely appealing although the lack of range will hopefully be addressed in time to support that. As for me…well, I have GAS (Gear Acquisition Syndrome) so I’ll be putting in a Christmas order. As mentioned in the article, the MagBox we were using is a prototype so the production model may vary. Next Are we overreacting about Railway Shoots? Great review Athol. Given you only took a few minutes to get it set up and firing for the shoot is a great selling point. Nice on mate.